A study into Active Debris Removal (ADR) has begun laying the foundations of a long term project to remove large pieces of orbital debris from space. The effort, which may grow into an international project, aims to eventually remove around five large pieces of debris – such as the numerous spent Upper Stages from Russian vehicles – per year. All orbital debris is a threat to active spacecraft, most of which is tracked via ground stations, allowing spacecraft such as the International Space Station (ISS) to undertake Debris Avoidance Maneuvers (DAM) if there’s a threat of a conjunction. Such an event of a threat is not uncommon, though most of the time the debris is eventually cleared of entering the “red box” once the tracking calculations have ensured the object will avoid the ISS by a margin of safety. Examples of when a late “red” conjunction has been spotted include the March, 2009 event, when a small piece of debris called a “yo weight” – which was originally part of a Delta PAM-D stage used to launch GPS 37 in 1993 – caused controllers on the ground to prepare the crew for a potential – though unlikely – evacuation of the orbital outpost. The debris passed without any impact. Small pieces of debris, such as MMOD (Micrometeoroid Orbital Debris) also impact the Station and the Space Shuttle orbiters, with small impacts regularly seen on the orbiter’s flight deck windows late in missions, whilst a few impacts have been found on the orbiter’s radiators once they return to their Orbiter Processing Facilities (OPF) for post flight processing. 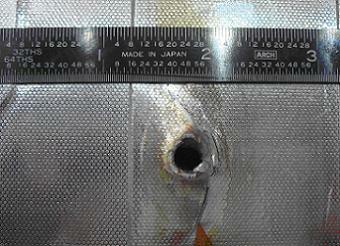 Endeavour after STS-118, and Atlantis after STS-115, provide such examples, with bullet-like holes was found on their radiators. Forensic examinations on Atlantis’ damage found a small piece of circuit board – originating from an “exploded Upper Stage” – in what was classed as the second largest orbital debris strike on an orbiter in the history of the program. Thankfully, the MMOD just missed one of Atlantis’ Freon-22 coolant loops, unlike Columbia’s STS-109, when a small piece of debris was lodged stuck in her coolant loop 2 and restricted the flow of Freon-22 in that loop. The amount of Freon-22 in the coolant loop was slightly below the flight rule red-limit, but after exhaustive analysis by the engineers on the ground, they decided to press on with the mission. However, ADR is being tasked with the removal of far larger pieces of debris, and from a higher altitude than that which the ISS and orbiters transit in. The associated presentation (available on L2) is aimed with a focus on the potential utilization of their skills and experience, as the ADR project builds the foundation of planning the technology and development of a system which is capable of removing the “massive objects” from orbit, with the potential to remove small objects via splinter versions of ADR. “Leverage the unique capability of the Orbital Debris Program Office (ODPO), Engineering, and Mission Operations to lead the early technology development and operations planning of ADR,” opens the presentation. “Provide new opportunities for Shuttle/Constellation workforce. EDIT: Although JSC is referenced, it has since been noted that ADR is simply an ongoing internal study conducted by the NASA Orbital Debris Program Office and it does not represent the official position of JSC. nor NASA. 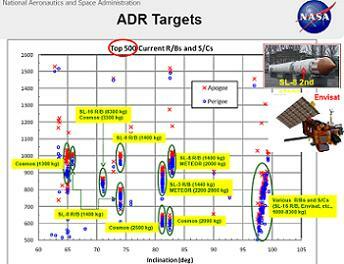 At five objects per year, ADR wouldn’t be short of targets, with over 270 spent upper stages from the Russian SL vehicle alone, all running around in an orbit of between 600 and 1000 km. 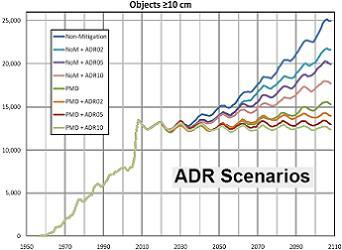 Noting that “to preserve the near-Earth space for future generations, ADR must be considered,” the presentation adds that even if there no new launches were conducted from now onwards – and taking into account some vehicles use a “25 year decay rule”, where expended stages are designed to eventually deorbit – the situation eventually worsens due to what is known as collision fragments. 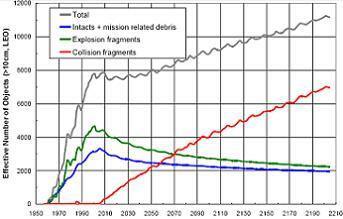 “Collision fragments replace other decaying debris through the next 50 years, keeping the total population approximately constant. Beyond 2055, the rate of decaying debris decreases, leading to a net increase in the overall satellite population due to collisions,” the presentation noted. The threat of orbital debris – especially from a collision fragment standpoint – has been known for some time, such as via the 2005 “Assessment of the Current LEO Environment” study, which was cited in the ADR presentation. “A major study (using NASA’s LEGEND model) on the debris environment was conducted in 2005. The current debris population in the LEO region has reached the point where the environment is unstable and collisions will become the most dominant debris-generating mechanism in the future. 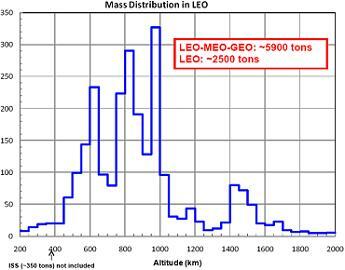 The mass of debris in orbit was also recently updated in October, 2010, which estimated that as much as 5,900 tons of debris exists, with 2,500 tons residing in Low Earth Orbit (LEO). As to the design of a spacecraft capable of sweeping up the large pieces of debris, no real details are forthcoming at this stage of the project. However, some basic ground rules – and questions to be worked on – are noted, such as the need for the system “repeatability” – thus avoiding the need to launch the spacecraft for the removal of each piece of debris. “Operations/Technology Challenges: Launch Single-object removal per launch is not feasible from cost perspective. Propulsion: Solid, liquid, others (plasma, tether, etc.)? Precision Tracking: Ground or space-based? Stabilization (of the tumbling targets): Physical or non-physical? Rendezvous: Autonomous and non-cooperative? Capture: Physical (where, how) or non-physical (how)? Deorbit: When, where? The next steps are also listed, NASA centric for the utilization of engineers from their skills and capability standpoint. “Determine level of MOD support for this activity. Suggest modest support from within MOD CS/Contractor workforce over the next few months. Identify additional funding opportunities to develop an ADR implementation plan/CONOPS. JSC IR&D. Center Management through JSC Executive Council. With NASA’s future still somewhat in limbo, as political efforts are made to stabilize the appropriations of funding outlined in the passed Senate bill – which refined President Obama’s FY2011 budget proposal – the project is likely to remain at the study level for some time. 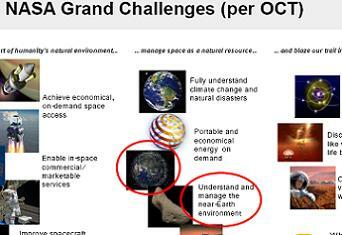 However, the National Space Policy of the United States of America (28 June 2010) – as referenced in the ADR presentation – does provide some ammunition for taking the project forward. (Images – All via the ADR presentation (L2), with the MMOD strike image via L2).